Another example of how Janice Blackmon Events makes every event flawless! For quite some time, I’ve been throwing ideas around in my head about writing an article on unique themes for celebrations and finally with a little help from W Hotels ~ Buckhead , the ideas have finally been put to paper. Whether you are planning a Birthday Party, Mitzvah, Groomsmen Grunch, Rehearsal Dinner, Couple’s Engagement, or Post-event After-Party – there are so many fun options. While some people decide to go to places like Dave and Buster’s or Andretti Racing – how about having your OWN Arcade. Your imagination can be your guide to determine what activities you want to include, but to give a few ideas of some favorite games consider some of these. Even actual carnival rides are available to rent for a party. Many times my clients will want something to do after their event for those that are just not ready for the party to end – so how about renting a meeting room or another function room at a hotel and have these games and activities brought in. Your guests will have so much fun just letting loose and playing. But in this situation – it’s your own private Gaming Room so you don’t have to worry about tons of other people being around. Who doesn’t like to play games and have fun….especially as adults when so much of our time is spent being professional. In a wedding situation, this would be an excellent idea for an addition to the Rehearsal Dinner or Post-Rehearsal Dinner activity – and if using a space at the hotel where your guest room block is, makes it very convenient for your guests. For a Mitzvah, since keeping the kids busy is the key to a successful event, why not have an Arcade Theme event. Instead of taking the party to one of the big complexes where it is sometimes difficult to keep up with everyone – having your own Arcade is the solution. I’ve been lucky to be the guest at several Arcade themed events, and to watch all of the other adults lose their inhibitions and play like a kid – truly enjoying him or herself is something to behold. So now you have an idea about games – what about the food? Well, keep in mind things that are easy to grab and eat – like sliders, or a Taco Bar. How about a Hot Dog Stand complete with all the trimmings? Pretzels and popcorn anyone? And if you are up for the true carnival spirit, how about Cotton Candy? The ideas are limitless. Specialty drinks for the occasion would be another nice touch or keep it super simple with Beer and Wine or for a kid’s party, soft drinks and juices. But to add another fun element, how about a custom smoothie station or a snow cone stand. Let’s talk a little about a Groomsman Grunch. Since Bridesmaids have their Bridesmaid Luncheon – why not a special event for the guys? Think Sports Bar for the food idea — wings, burgers, etc., and beer or scotch tasting for another special idea. Many restaurants will offer this type of event – perhaps in a private room – but this can also be done in a host hotel utilizing a small meeting room. Large TV’s could be brought in so that the guys can watch their favorite sports while enjoying the friendship and yummy food. One super cool place that works great for a Guys’ party is STATS in Downtown Atlanta. Of course, being a sports bar, the atmosphere is already present with TV’s all around – but there are also a few areas within the Restaurant that offer a semi to completely private event. A very common type of event for couples these days is either an Engagement Party or a Couples Shower. What better way to get the guys excited about the party than have fun, arcade type activities for them to busy themselves with. But don’t think those ladies won’t take a turn or two at the fun games, in fact, I wouldn’t be surprised if some light-hearted competition ensues. The possibilities are endless, so if you are ready to plan your next Party and want to include the Arcade theme – let us know and we will hook you up with the best vendors to provide you the fun games and activities that your guests will appreciate and will truly say that YOUR event was the best one they have ever been to. 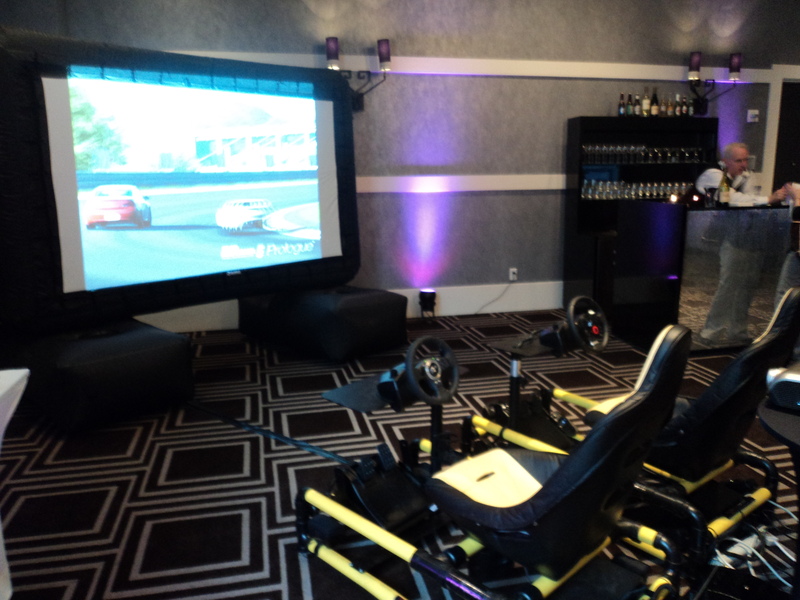 So when you are ready to plan that next Arcade themed event, contact us and we will be sure to make it flawless!! Atlanta, GA with services available worldwide! Weekends are dedicated to our events!